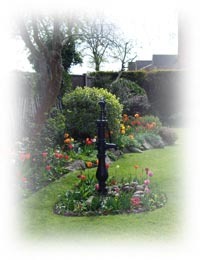 Our House is set in a pleasant and private garden, with secure parking facilities within the grounds for guests arriving by car. We have a delightful dining room which can be used for private functions, such as board meetings, whilst our sitting room is the perfect place to sit and relax at the end of the day. 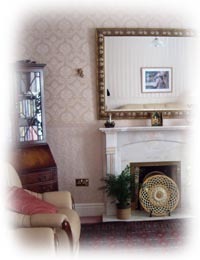 "Lovely house, lovely room, friendly welcome. Altogether excellent." "Thank you very much for making us feel at home. 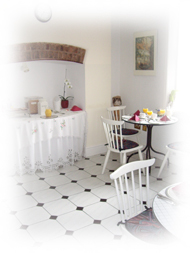 We enjoyed every minute of our stay"
"A most wonderful guesthouse, quite enchanting"
A choice of English or Continental breakfast is served in the breakfast room. 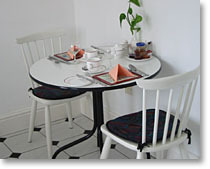 A typical menu also includes fruit juice, a variety of cereals, toast, cheeses, a choice of jams and marmalade, tea and coffee. Special dietary requirements can be catered for if requested in advance.